In a bizarre turn of events yesterday a member of the CSM decided to air his views on the current state of the organisation in his personal blog. This blog did not contain anything that would be considered confidential or under any type of non-disclosure agreement. It was merely FunkyBacon writing his blog for his readers and expressing his own personal feelings on the shortcomings of the CSM along with the fact that, what could be a very useful tool for the CCP developers is being squandered. During the 6 week release cycle, as much as half the patch notes (if not more) are seen by the CSM at the same time as the rest of the Eve community. Many changes that are put in front of the CSM for “feedback” are shown mere hours before being released on the F&I forums or in dev blogs giving no time for meaningful feedback, or to make any changes to the initial offering based on that feedback. Outside of maybe fixing a typo or the wording of a sentence, changes are often dropped to the community almost untouched from what was shown to the CSM. Unfortunately, when the CSM is bypassed entirely, or feedback is unable to be acted upon because of the short amount of time between when the CSM gets the info and when it goes public, many of the changes to proposed developments (take Freighter changes earlier in the year, or the Nullsec jump nerf for example) are a result of angry mobs on the forums, bloggers, and writers for the various eve related news sites lashing back at CCP. Many of the changes made may have been suggested by the CSM before the original post went public, and had the CSM been listened to or utilized properly, much of the trolling and negative backlashes would have been avoided entirely. Some people might think of this as a scathing attack on CCP, but I don’t think the majority of the CSM’s misuse has been due to a negative attitude at CCP. I honestly believe that for many devs, they might feel intimidated presenting something to the CSM, like their work is being put on trial to be judged. I have to put a disclaimer on that statement that no one at CCP has said as much to me about feeling intimidated, but it’s certainly one of the vibes I’ve gotten over the course of the term. In the rest of the blog FunkyBacon comments on his own ‘bittervet’ level and if it was not for the community that surround EvE online, then he would of probably left this game years ago. 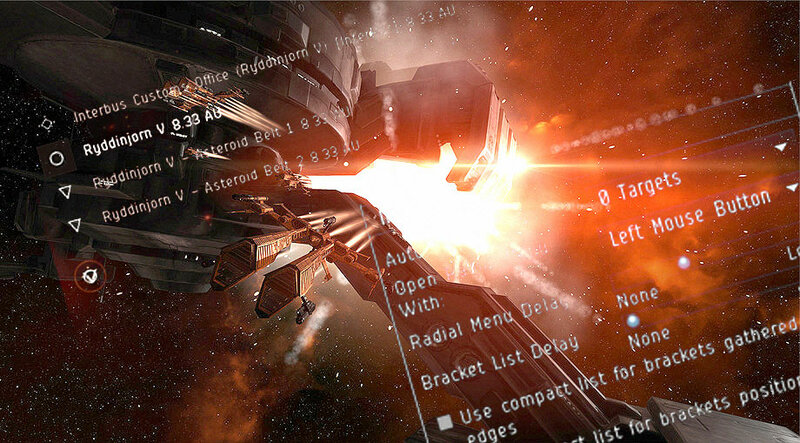 FunkyBacon also talks about the effect bloggers, EvE news sites and rage on the forums have on the development of EvE. As said in the quotes above, the CSM pointed out the errors in certain patches, like the Jump Freighter in Phoebe and that it was unnecessarily harsh, but it was not until it was released and the community started their own backlash against the changes that CCP went back and tweaked it. If they had listened to the CSM in the first place this issue would of been resolved before publicly released. This is just one example. FunkyBacon, as a lot of bloggers do, linked his new blog post to his twitter feed. What he didn’t expect was a backlash from CCP themselves, in the form of CCP Leeloo, the CSM Coordinator, who immediately went on the offensive. For a point of reference, Confluence is a programme that CCP uses to share information with the CSM and also internally. It is possible to give feedback on anything that CCP posts on it for your level of viewership and is a tool which CCP use a lot. @ccp_leeloo #tweetfleet Ok, so you want to talk about logging into confluence. First, I didn’t bring up confluence because I assumed that particular site was NDA. I have actually logged in several times, and every time someone from CCP deigns to notify the CSM of an entry requiring review. Your claim that I haven’t logged in is patently false and I dare say a lie. I don’t always have something to say, because hey, why waste breath if it’s not something directly affecting lowsec or my highsec ganker bros, it’s not like the teams heed the advice before the trolls get hold of it. You will however find my most recent comment (in confluence) on the 25th of January regarding a feedback issue which I am quite sure is still under NDA. I find that to be quite amazing for a guy that never logs into confluence to read and give feedback on proposed changes though. Before that, I was in to review the daily minutes at the summit I was mostly unable to attend due to work requirements, and before that confluence was barely used, much like the internal forum that did not see a single dev post from mid december until AFTER the summit, though myself and other posted questions for you guys that went unanswered. As far as meetings, it’s extremely hard to make a Friday 2pm GMT (9am Local) meeting when you work a 9 to 5 job. I believe I have asked more than once for earlier meetings that I might alarm clock for (say 10am GMT) but when you deign to threaten other members of the CSM with “The FunkyBacon Treatment” for having a less than rosy outlook on the happenings of the CSM, I’m not surprised one bit that accommodation was never made. I do make a point however, to review and watch the video recordings you send us through e-mail. The reply to this from CCP Leeloo was short and to the point, basically saying that there was nothing more to say on the subject from her point of view. After this a document which showed the attendance for each CSM member for the summer and winter summit meetings was linked and showed that FunkyBacon had only attended 17% of the meetings for the summer summit and that he had only made it to 21% of the winter summit meetings. However, as FunkyBacon mentions in his blog, he did book the week off for the summer summit meetings but they were then pushed back which caused him to miss the majority. As for meetings, I made sure to attend the most relevant summit meetings. You might recall some hullabaloo over the awoxing nerf, clone changes, and a few other incidents, many of which are covered on this blog. I was in those meetings, gave feedback, and feedback was largely brushed aside until the media portion of Eve’s community got hold of it, and with our efforts, changes were made. For the regular meetings, between summits, most of them are sparsely attended and I’m not the only one who can’t make them. All of us are provided a recording of those meetings through e-mail and given the chance to provide feedback. when I have something to say, I pass it along. Until the switch to confluence recently, I was also a regular participant on the internal CSM forum with feedback in nearly every dev posting excepting areas of the game where I felt my lack of experience would not allow me to give decent feedback, such as wormholes, or 3rd party development. A couple of well known bloggers left comments on the original blog post, both of them supporting the view that the CSM does not meet the expectations that the players, and the CSM members themselves, expect and that media sites, forums and blogs hold more sway over the development of EvE than the CSM does. In my personal opinion the CSM is under utilised by the CCP developers and releases/patch notes need to be released to the CSM for their feedback with sufficient time for alterations to be made before going to the public. Things like Phoebe and, most recently, the new changes to high-sec corp awoxing need to be looked at and opinions need to be listened to. The fact that the CSM are expressing their opinions and then the patch notes are released before the CSMs point of view is taken into account is not the best way for the CSM to be utilized. The CSM represent the voice of our community, or at least it should, and if they notice something that the players won’t like, they should be able to point that out and know they are being listened to. The fact that CCP are told that this or that needs changes and only does it after they release the patch notes and it causes backlashes within the eve community is wrong and that is why we vote for the CSM, so that they can intercept these issues before they are public. However you have to give CCP credit for even having a group like this involved at any stage of development. The fact that they try to get a selection of the community involved and to give the chance for feedback from the EvE community is a great part of EvE. Looking back at the Erotica1 situation last year, Ripard Teg the CSM member was incapable of convincing CCP to act against the Bonus Room’s shenanigans, but Ripard Teg the blogger was able to whip up a community backlash so severe that CCP had little choice but to cave E1’s skull in with the ban hammer in what turned into a public spectacle. Before I even thought of running for the CSM myself, I was one of the voices able to influence the balancing of T1 haulers, and had more effect on that balance pass than I’ve had on any balance pass since I’ve been on the CSM. Between the summer summit and the release of the minutes, I bashed my face into a proverbial brick wall to get a compromise on the highsec awox nerf and got nowhere. Minutes were released, myself and others wrote some blogs about the issue, and a bit of backlash hit. A couple weeks later I joined CCP Fozzie on DJ Big Country’s show on Eve Radio where it was FINALLY revealed that CCP was considering making intra corp aggression a toggle. I wanted to scream in frustration because I’d been advocating that for months at that point, and to think I could have skipped 2 months of frustration and just jumped on the issue when the minutes went public was the last straw. 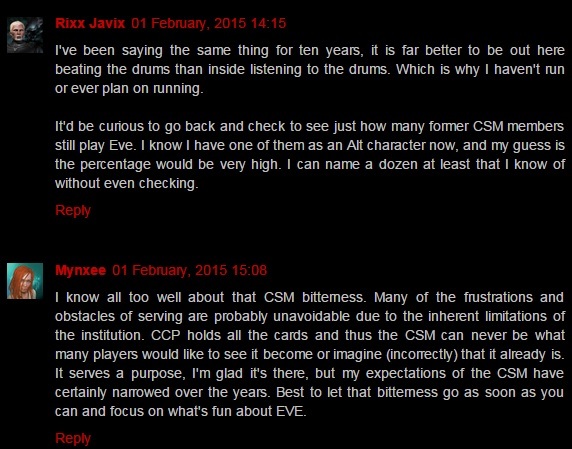 The fact is, CCP might hear what the CSM has to say, but they heed the community mob. At the end of the day, the CSM is an under used tool of the CCP developers and until the majority of the CSM stand up and tell them that, they will continue to be under used. I am not advocating that all releases must go through the CSM before they go public, only that major gameplay changes should have a window of CSM discussion to try and iron out any issues which will cause the player base to react angrily. The CSM is there as the first point of contact between the development team and the masses and they should be used as a sounding board, and they should have ample time to discuss and bring up any issues. No one is saying that FunkyBacon is not being truthful in his blog, thats a big thing. CCP Leeloo could of come out and said that it was all a lie and that plenty of time was given for the CSM to go over each gameplay change, however she did not and I believe that FunkyBacon has been totally and brutally honest in regards to his CSM term. I will however, take vindication that while my character was assaulted almost non stop, not a single person stood up to say that anything I had claimed in the post that started all this was false. Many people agreed with it, a bunch of folks engaged in personal attacks, and the rest were just silent. The array of responses should be telling in itself. When it comes down to it, my hope with that blog is that CCP takes a hard look at how they utilize the CSM, because the CSM doesn’t have the capability to wedge their way in themselves no matter how nice OR forcefully they express themselves. There is no rule that any CCP employee aside from the CSM coordinator has to talk to the CSM, and nor should there be. What there should be is a desire to talk with and include the CSM more, because the many minds will only make the whole stronger. What are your thoughts on this issues? Do you believe the CSM is used correctly by the CCP developers? How would you like to see them utilised? How do you rate the fact that a CCP employee decided to weigh in on the blog at all? I’ve had my say during this article, now I open it up to you, the readers and player base of EvE to have your say. Leave a Reply to oink Click here to cancel reply.